The crane is known for its longevity. It is believed that the crane lives such a long life because its body contains a large amount of jing, or essential energy. 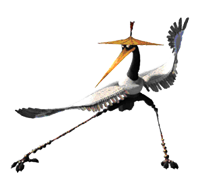 A calm, meditative animal, the crane can stand on one leg for hours, without shifting its weight or growing restless. The crane form helps the practitioner hold his internal energy, which develops strength while building bones and muscles. Crane techniques are circular in nature and are always soft and relaxed, but strikes are with penetrating speed and force. The crane form is known for using the "beak" to strike to targets such as the temple. It is also known for its long, extended strikes that mimic outstretched wings. The crane form allows the practitioner to deliver flowing, relaxed power as well as sudden and focused attacks.